YOURSAY | If Bersatu is looking like Umno 2.0, PKR is on the path to morphing into Umno 3.0. Roger 5201: Deputy Prime Minister and Minister of Women, Family and Community Development Dr Wan Azizah Wan Ismail should not have waded into controversial Sarawak waters in any capacity, let alone announce a RM100,000 allocation with Julau parliamentarian Larry Sng. Even if PKR deputy president candidate Rafizi Ramli wins, his integrity and legitimacy will be seriously compromised, and the party's credibility will be undermined. Malaysianmalaysian: Yes, Wan Azizah should not have announced that RM100,000 allocation as monies coming from the government coffers makes her announcement an abuse of power. She has lost so much credibility. It really goes to show her seat-warming days – which the rakyat tolerated because of Anwar Ibrahim's incarceration – have gotten to her head. Where is the accountability her party used to tout before? I wonder if Nurul Izzah is okay with all these actions of her father and mother. As they are elected representatives, it will definitely affect her reputation too. Anonymous_07df3758: PKR has some nerve trying to prevent Umno MPs from joining Bersatu when it accepts someone like Larry Sng, who was an assistant minister under the dubious former Sarawak chief minister Abdul Taib Mahmud and the son-in-law of a controversial tycoon. It would be a travesty if it turns out that the Julau division determines the outcome of the entire PKR elections just because it has suddenly seen a huge surge in members. I hope the MACC investigates thoroughly and arrests those who are allegedly trying to pull off this farce. As for Wan Azizah, I have long lost my respect for her. SLYeap: A young upstart who was a Taib Mahmud man with deep pockets, who can magically make 13,000 members appear out of thin air! How can the deputy prime minister ignore such blatant irregularities in the members' register and use her position to allegedly attempt to buy votes by declaring allocations? If Anwar and his cronies, including his family, are in cahoots with such people, PKR is doomed to become Umno 2.0. If this happens, it would be best if the decent people in PKR jump ship to Bersatu, Amanah or DAP and kick this PKR bunch out of the coalition. 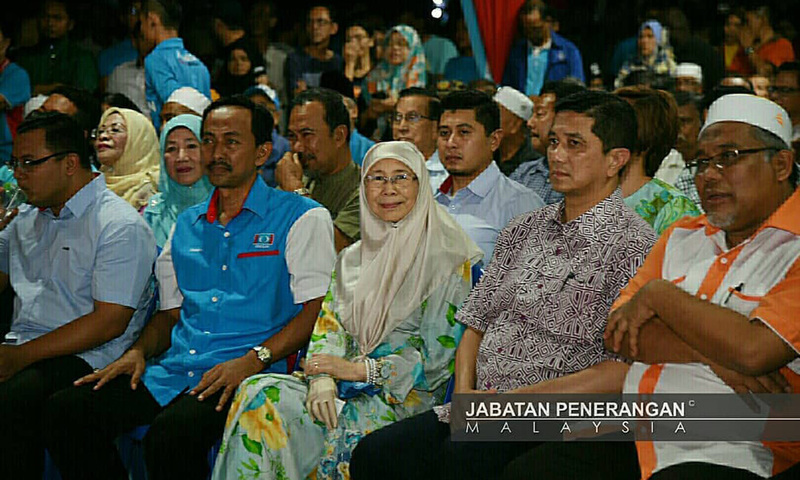 Anonymous_1419577444: As the outgoing president of PKR, Wan Azizah would be expected to demonstrate leadership and deal with the problems in the party election process. Instead, she has remained docile and silent. On top of that, she does things that suggest she is helping her favourite candidate. Her conduct and that of the current PKR leadership in handling this party election demonstrate a total disregard of accountability, transparency and integrity even at the most basic level. It is like these people do not care, they just want power and win at all costs. And one of them is claiming to be the future prime minister. Anonymous 2393041450843742: Wan Azizah did wrong! She couldn't and wouldn't have done it without Anwar's knowledge. This was certainly done to favour Sng and Rafizi as well as Nurul Izzah. After the Kajang and Port Dickson move, is this the way to repay their debt to Rafizi? Shame on you. I am beginning to lose confidence in the party that I have voted for since 2004. Do they have the qualities to lead this nation? Righteousness4all: PKR is in real shambles. In fact, they never got out of it. PKR then and now is all about Anwar, the individual. Are fame, position and power of the utmost importance for a politician? Hopefully, PKR supreme council member Latheefa Koya will not be reprimanded and sidelined. Leanne_chong: Latheefa always likes to meroyan (rant) on Facebook. Why is this even news? Of course, when your team gets a major slap in the face, you start talking about fairness, etc. When it favours you, you stay quiet. Latheefa has no credibility at all. The Watcher: Leanne_chong, it looks like you are the one who meroyan here. It's Team Rafizi/Wan Azizah who got the major slap when the alleged big-time cheating of 13,000 new voters by their ally in Julau was exposed and MACC took action. So far, MACC actions in Kedah and Sabah have been against Rafizi’s gang. What does that tell you? Kader: Latheefa says Zuraida Kamaruddin (who is part of Team Azmin) went on Nov 5 in her capacity as a minister. Into the eye of the storm five days before voting. Acceptable, right? Now, who is taking sides? Azmin Ali and gang have, on the coaxing of interested people, forced this on Rafizi. Anonymous 562531438261476: Wan Azizah not investigating the Julau jump in membership is wrong. Now her going to Julau confirms the Julau increase in membership was planned. Anonymous_3b6c1f0c: This is Anwar scheming to ensure that the entire PKR leadership is filled only with his people. And Julau was planned to be Team Azmin’s Waterloo. What does the deputy prime minister who is minister for women, family and community development have to do with infrastructure? She is out to help make sure Azmin and team lose so her husband can make a strong push to be prime minister by January 2019. Shovelnose: Old habits die much harder, no? Clear and fair leadership from Kak Wan? I’m not expecting much from this seat warmer. She has demonstrated a total lack of leadership from the day they pushed her into the hot seat anyway. A nice person, but definitely not cut out for the cut-throat world of politics. If Bersatu is looking like Umno 2.0, PKR is on the path to morphing into Umno 3.0. Sirach: It looks like the Anwar faction is facing trying times, with Azmin clearly in the lead. So they (allegedly) resort to questionable tactics to turn the tide. Hopefully, it backfires big time and devastates the prospects of the prime minister-in-waiting’s hopes of taking over from Dr Mahathir Mohamad. Also, if the allegations are true, our deputy prime minister may be revealed to not be that squeaky clean, after all. Anonymous 770241447347646: We are slowly but surely returning to the good old days of BN, where manipulation was the name of the game and cash was king. Abasir: Reformasi is for the plebeians, not the PKR royalty. The sooner everyone realises that, the better it'll be for everyone.